Pondering The Popularity Of The Pet Rock — And Other Fads They were all the rage for a brief, mid-'70s moment, and they turned their creator into a millionaire. What was so special about rocks in a box? 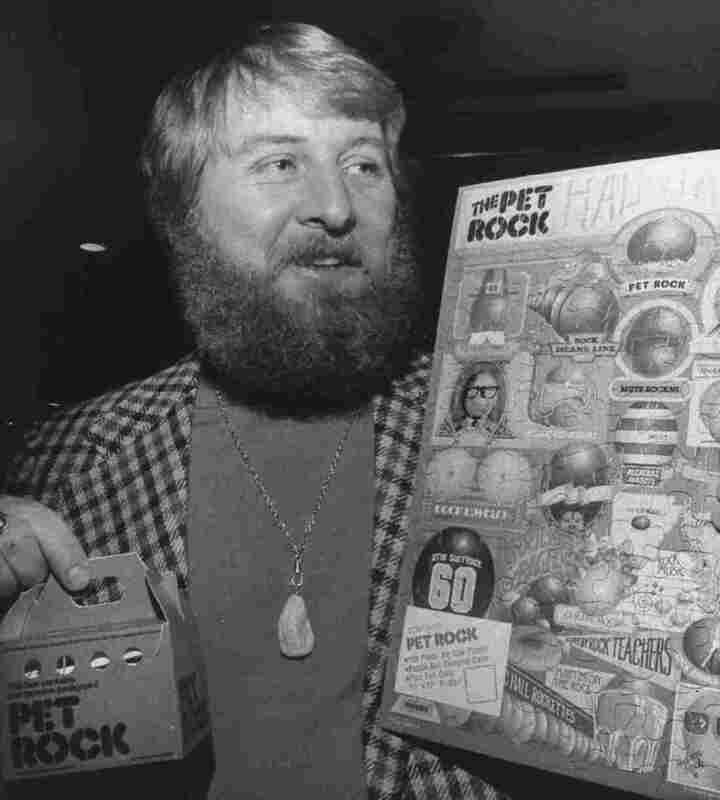 Pet Rock creator Gary Ross Dahl became a millionaire from his rock sales in the 1970s. Each rock came in a special box (bottom left) with a detailed instruction manual. The Hula Hoop. The pogo stick. The Tamagotchi. Fads, crazes and must-have toys all sweep the country from time to time. But in the annals of faddish toys, one achievement stands tall — or rather, sits small: the Pet Rock. It was exactly what it sounds like: a rock (a Mexican beach stone, to be precise) marketed in the mid-'70s as a pet. Each came in its own box with air holes and a detailed owner's manual. "If, when you remove the rock from its box it appears to be excited, place it on some old newspapers," the instructions read. "The rock will know what the paper is for and will require no further instruction. It will remain on the paper until you remove it." More than a million were sold at $3.95 each. The Pet Rock's creator, Gary Ross Dahl, died this week at age 78. Thinking of Dahl and his enormously popular rocks, we wondered why these fads and crazes catch on. Richard Gottlieb, the founder of the New York-based consulting firm Global Toy Experts, shared his thoughts. [Dahl] was extremely fortunate because it's one of those moments that are like lightning striking or an act of God. They just happen and we're never really quite sure why. I think it happens in other places, but I think it's really driven in America. And the fads I like the best are the ones like the Pet Rock, which are what I call "populist fads." They're not manufactured; they're very sincere and they're bottom-up. I have spotted good ones. I've been right; I've been wrong. There are some people who really do seem to be better at this. There's a company called Moose Toys that has a product out right now called Shopkins, and it's a fad right now. And all it is is little, tiny, plastic versions of things you would buy in a shopping mall, but they have little faces on them — like little coffee cups, a piece of food, a piece of corn. Kids collect them like crazy. And I think one of reasons kids like products like that — or like a product called Silly Bandz, that was very popular three years ago, which was simply rubber bands in the shape of animals that you collected — it's because they're affordable. They don't cost a lot of money. And it starts on the playground social network. Somebody sees somebody who is cool with something like Silly Bandz and it takes off, and it just organically moves from city to city. I think that these children today don't have that line of demarcation between what is real and what is virtual that we have. They live in a much bigger universe than we do. And so they don't feel we're doing them a favor if we give them an analog toy and we add some kind of Internet aspect to it. They expect it. But I think there's still always going to be room for the things that children love to do, which is collectibility — they love to collect things — and inexpensive, and something that they can own, and is special to them, and they can relate to their friends around it.